Together with its sister slope, Big Boulder Ski Area, Jack Frost Mountain is one of Pennsylvania’s most popular resorts. With a dozen lifts servicing 22 slopes, Jack Frost Ski Resort skis bigger than its relatively short 600 foot vertical drop (from a summit of 2,000 feet). If Big Boulder is the snowboarders ski area, Jack Frost PA is the place for skiers. Experts should head all the way skiers right for the double blacks accessible from the East Mountain lifts (including some moguls and glades). Intermediates will enjoy the black-rated Challenge and blue-rated DeMotte’s Demise. An isolated area of green runs at the left of the mountain provides easy terrain for beginners, and first-day skiers have a gentle learning area above these slopes (carpet for kids only). There’s also one park run in the middle of the mountain with a half-pipe towards the bottom. 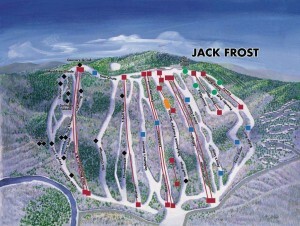 Jack Frost PA trail map. Clickenzee to embiggen. After operating Big Boulder Ski Area since the 1940s (see more on the history of Big Boulder PA here), the owners decided to open a higher, more challenging resort, launching Jack Frost Mountain in 1972. So, unlike many Poconos ski resorts, Jack Frost Mountain is laid out now pretty much as intended, with just a few upgrades: a well-designed mountain. Recently, Jack Frost Ski Resort added two surface lifts for its snowtubing operations, which are rated among the best in Pennsylvania.